We are located on the eclectic 30+ acre surrounded by picturesque mountain views at the edge of the undeveloped Lake Mead Recreational Area. Your adventure begins with pick up from your Las Vegas hotel by one of our master tour guides in a luxury shuttle. 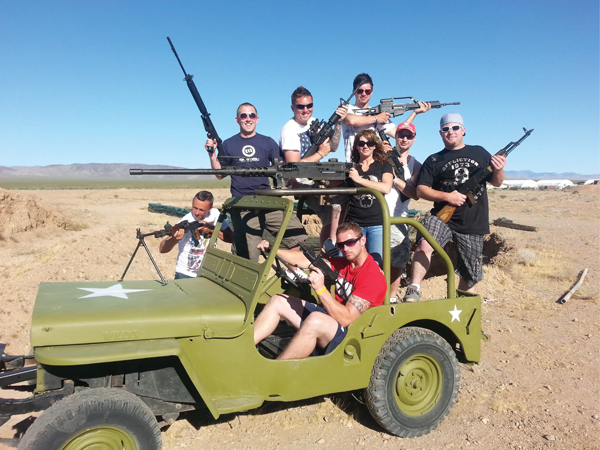 Drive through the scenic Mohave Desert as your tour guide explains the history of the weapons, Hoover Dam, and Las Vegas.Before you arrive to the range we will stop at the Hoover Dam Bridge for a 15 minute photo opportunity. Then we will continue through the Mohave Desert and arrive at your r combo packages which consist of: private outdoor military style bunker set in a unique ‘Desert Storm’ atmosphere for your amazing shooting experience. To top it off, lunch is included at our onsite restaurant and bar. You will be treated with our World Famous All-American Burger, fresh cut fries, and soda. Guaranteed the best burger ever! Express runs available, approximate time 2.5 hours hotel to hotel. We also offer Grand Canyon Helicopter, Motorized Scenic ATV Tours, Muscle & Exotic Cars, and Harley Rentals are available. We also guarantee the best Bachelor Party, Birthday Party, Cooperate, and Group Events. If you would like to maximize the time while you are in Las Vegas we recommend our combo packages leaving you more time to have fun on your stay! At our range is a 5,000 square foot bar and restaurant with an outdoor patio. We can accommodate up to 200 people for Cooperate and Group events, see our Bachelor Party and Birthday Party specials. Free Bar and Free Rounds. 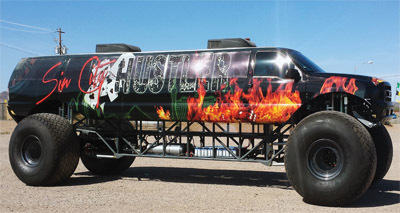 Add an ATV Tour or Grand Canyon Helicopter Tour to any shooting package and receive tickets to a free Las Vegas show! Choose from the amazing MJ Live or The Rat Pack is Back! These two great shows have been hailed as “must see” live performances when visiting Vegas, don’t miss out on your chance to experience one of these great shows. *One free show ticket per combo package purchased. You must call our reservation line at 702-825-1411 to redeem voucher. Ticket vouchers will be given to you at time of tour. All vouchers must be redeemed at the box office prior to preferred show time. All shows are subject to availability and do sell out. We highly recommend that show tickets are redeemed in advance at least one hour prior to showtime. Show tickets cannot be redeemed for cash value. No refunds will be offered for show times that are sold out. Select your adventure from the top of this page or call (702)825-1411 to find out more!